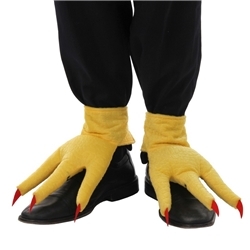 The Chicken Feet come as pictured in Adult One Size Fits Most. Express your fowl inner self! Dressing up as a Chicken is one of the most classic Halloween costume ideas. We carry many options for full costumes, but if you’re looking for something more DIY that you can piece together, we’ve got your feet covered. Don’t be a drumstick – get your pair of chicken feet today!